Sheriff's deputies apprehended two teenagers at a Rancho San Diego Verizon store Friday evening after someone called 911 from the parking lot to report an apparent robbery in progress. 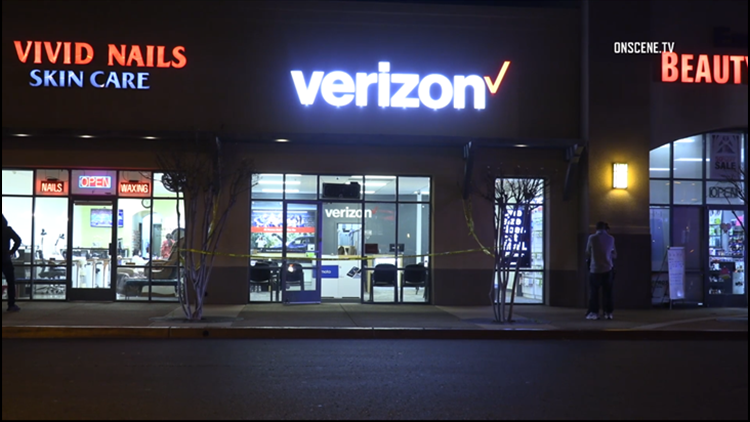 EL CAJON (CNS) - Sheriff's deputies apprehended two teenagers at a Rancho San Diego Verizon store Friday evening after someone called 911 from the parking lot to report an apparent robbery in progress. The caller reported seeing two men wearing masks enter the Verizon store on Jamacha Road east of Campo Road around 6:20 p.m., San Diego Sheriff's Sgt. Michael Hettinger said. As the two would-be robbers entered the store, one pointed a gun at the four employees, Hettinger said. The two demanded cash from the register, then forced the employees at gunpoint into a back storeroom. Hettinger said the suspects forced the employees to give them cash from their wallets and open a safe containing a large stock of cell phones. The safe had a built-in delay system, forcing the suspects to wait to steal the phones -- and possibly giving deputies enough time to arrive. After the delay cycle ended, the suspects instructed the employees to put the phones in bags they had taken with them, Hettinger said. The two then tried to leave through the back door of the store, just as deputies were setting up a rear perimeter. Upon hearing deputies' orders to surrender, the suspects ran back into the store and tried to leave through the front, but ran into deputies there as well, Hettinger said. The two -- later identified as a 16-year-old boy and a 17-year-old boy -- were taken into custody without further incident. Deputies recovered the phones and the gun inside the store, and a large amount of money was recovered from one of the suspects, Hettinger said. None of the employees were injured during the incident.